Background: Nanoscale zero valent iron (nZVI) is one of the most commonly used nanomaterials for soil and groundwater remediation because of its high reactivity and effective contaminant removal rate. 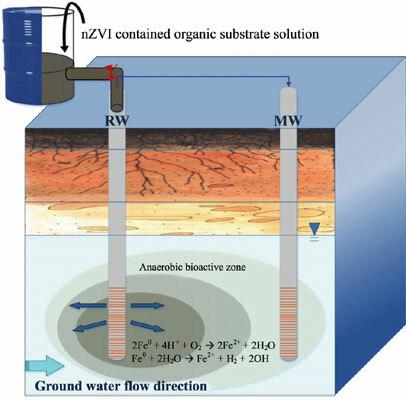 Objective: This paper reviews the methods of nZVI syntheses and effect of nZVI application on contaminants removal, environmental conditions, and microbial growth when anaerobic bioremediation is used for polluted site restoration. Application: Dispersants have been applied to minimize the aggregation of nZVI particles and enhance its migration and influence zone. nZVI has also been applied to enhance the in situ site remediation process. Although there are advantages to combine the nZVI with bioremediation systems, the possible influences caused by the nZVI application contain changes of environmental conditions including the adverse effects on microbial species and diversity. The patents related to the designs of combining nZVI and different types of organic substrates for bioremediation enhancement are summarized in this paper. Future Study: Toxicity evaluation and risk assessment are necessities to minimize the impact of nZVI application on environments and ecosystems. Keywords: Nanoscale zero-valent iron (nZVI), reductive dechlorination, anaerobic bioremediation, toxicity, contaminated soil, hydrophobic modifiers. Keywords:Nanoscale zero-valent iron (nZVI), reductive dechlorination, anaerobic bioremediation, toxicity, contaminated soil, hydrophobic modifiers. Abstract:Background: Nanoscale zero valent iron (nZVI) is one of the most commonly used nanomaterials for soil and groundwater remediation because of its high reactivity and effective contaminant removal rate.